skulls greatly assist our world and all the people here? 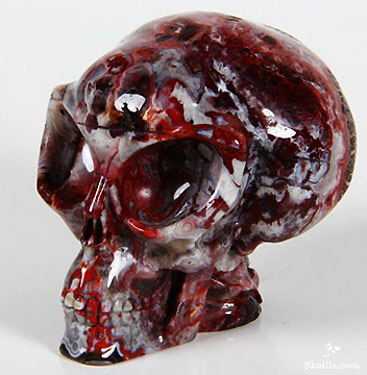 Hello dear visitors to the Skullis website, where some of the best carved crystal skulls in the world are being made by the wondrous Chinese carvers employed by this company. We ourselves, have a special crystal skull that was gifted to us by Skullis in 2011, by the name of Rosalita (see a photo of this crystal skull below). Many people who have met "Rosalita" have felt a very loving and healing energy emanate from "her". "She" has even had a small crystal just miraculously appear in "her" left eye at the end of 2011 when she sat with a spiritual medium that we know. The act of an object that appears seemingly from nowhere is call "apportation". (c) Joshua Shapiro & Katrina Head "ROSALITA" - A beautiful rose quartz crystal skull created by one of the master carvers of Skullis and gifted to the Crystal Skull Explorers in the fall of 2011, arriving on the day they were leaving for a coast to coast tour in the United States. "Rosalita" is human size and is comprised of two pieces with the lower jaw separate from the top part. She was initiated to become active (or alive) in two manners. First we shared with "her" some video showing the well known Mitchell-Hedges Crystal Skull to help "awaken" "her. Second, we took "Rosalita" to a special lake in the NW part of the state of Washington, that a group in Europe told us about which had a special energy vortex present. I did a personal meditation with "Rosalita" listening to music at this location and I was profoundly touched with tears in my eyes. These are examples of what one can do to bring their personal crystal skull alive! The purpose of this article, is to fully describe what the crystal skulls are all about. I will share a brief history, along with a definition of the different type of crystal skulls which exist plus how the crystal skulls have affected various people and positively changed their lives. Also I will offer some suggestions how to work with your personal skulls for the best results. I have personally been involved with crystal skulls since 1983, when I saw my first very old crystal skull called "Ami" (made from amethyst quartz and discovered in Mexico) in San Jose, California. This article will be a combination of materials I have written before with some updated materials. Further, we are known as the Crystal Skull Explorers which includes my divine life partner Katrina, myself and the over 20 crystal skulls we have in our possession. So let me first give a good definition about what is a crystal skull. Well as this name or term implies we are speaking about a skull shaped object that the first crystal skulls which were uncovered near ancient ruins in Mexico were made from various types of quartz crystals (clear, amethyst, smoky, rose, etc ...). However, today we have to define a crystal skull as any type of gemstone that has been fashioned into a skull shape (including animal skulls, dolphins, Extra-terrestrial and other). Most of us are familiar with quartz crystal as this gemstone is a key component within all of our modern-day electronics; devices that we use each and every day (including the computer, phone or tablet you are using to read this article btw). There are many people today who are working with their personal crystals in order to re-energize themselves, for healing (physical or emotional problems) or even to assist them in their development of their inner or spiritual gifts. (c) Skullis "NEW or CONTEMPORARY" - These are crystal skulls that are being manufactured by modern carvers such as Skullis employ. There are thousands upon thousands of such skulls in existence today and more being created every day. 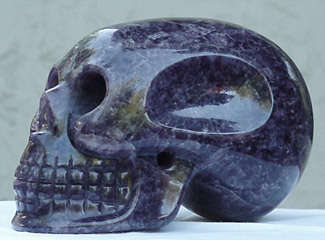 As stated, every type of gemstone is being used to manufacture these modern skulls. Since the middle part of the 1990's, there has been an explosion in the interest about the crystal skulls. There are quite a few people now, in all parts of our world, who have acquired their own personal skull to work with and use. The contemporary crystal skulls come in all shape and sizes and are being primarily done by carvers in China and Brazil. These skulls can even be found for sale upon E-Bay of which Skullis has a very very strong presence. The picture of the crystal skull to the left on top is from our personal skulls known as "Portal de Luz". He is comprised of smoky quartz and was carved by a well-known Brazilian Carver. 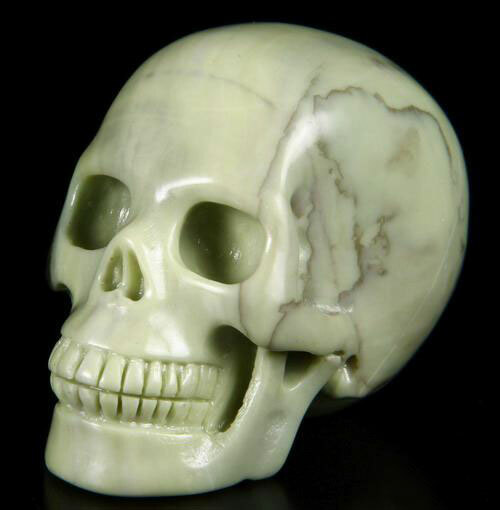 The picture of the crystal skull to your left below the other one is an example of the wondrous crystal skulls which Skullis is making and providing for many people all over the world that is made from jade. One of the carvers of Skullis was featured in a special crystal skull documentary shown in 2012 called "The Truth about the Crystal Skulls", which also featured the author of this article as well. I would like to make a few more comments about the modern crystal skulls being created by today's carvers. 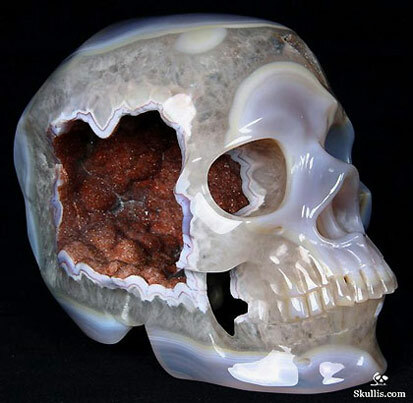 To make a crystal skull does take a very talented person as in particular, when a skull is made from quartz crystal or other types of stones which are comprised of a very hard substance, it is not easy to cut these stone. For example, if the carver doesn't cut the quartz in just the right way the stone can shatter. Therefore, diamond tip tools (saws and wheels) are being used regularly by the carvers as diamond is one of the hardest substance we know and is able to cut through such hard gemstones like butter. Never-the-les, to get the shape of the skull to look like a human bone skull, the carver has to be very skilled. It used to be in the early days, when these new skulls first came out (in the 1960's and 1970's), the features of these modern-made skulls were quite primitive. The eyes, mouth and nose were hardly defined at all. But now, as we see with the carvers at Skullis, and as they were able to produce with our crystal skull "Rosalita", they are getting very good at making the skulls look very human-like or realistic. Or, many people are also asking for more stylized type of skulls to be done as well that can be in many shapes and forms. 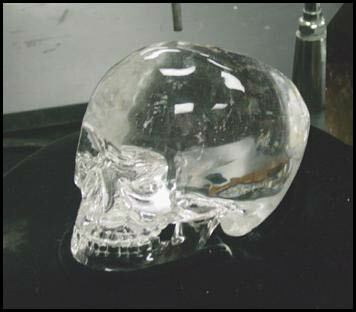 (c) Joshua Shapiro "OLD" - This is a crystal skull that was created between 100 years ago to about 1000 years ago. A number of these types of skulls have been discovered within or near ancient ruins in Mexico or Central America. 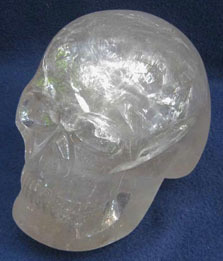 In general, the appearance of these crystal skulls are somewhat more crude in form and upon a closer examination of their surfaces of such a crystal skull, there are usually observed some type of tool marks left by its carver or creator, similar to what can be detected with the newly made crystal skulls. The biggest challenge to identify an old skull is we don't have a system that can date quartz crystal or other stones like Carbon 14 Testing which needs an organic substance to do the dating (the decay of the Carbon atom) for which quartz and other minerals are definitely not. In the photo to your left is the British Museum Crystal Skull, about 12 lbs. in weight, made from clear quartz and which was discovered near ruins in Mexico. It has been on display since 1898 and is now in the British Museum in London. Additional Notes about what we call the Old Crystal Skulls - just within the country of Mexico, in the ground, hundreds and hundreds of crystal skulls have been uncovered when the past ten - fifteen years. When I had the opportunity to visit Mexico City twice in 2009, I saw many many crystal skulls, of all shapes and sizes that I had never heard of before of which some were hollow. It is thought that possibly some very advanced crystal skulls by their design and form were known to the Mesoamerican civilizations, which they had in their possession that came from much older cultures. Two indigenous groups who discuss such skulls include the Maya and the Aztecs. These cultures claim that to them, the shape of the human skull was a symbol that represented Man's connection to a Godhead - and thus they created thousands of crystal skulls perhaps even using some of the very old or ancient skulls they had in their possession as models. The British Museum Crystal Skull is very similar and size and shape to the most well known Crystal Skull known as the Mitchell-Hedges Crystal Skull found in 1924 in Belize, named after the head of the expedition who discovered this skull, F. A. Mitchell-Hedges, a British Explorer. 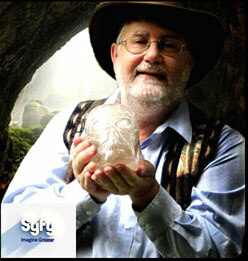 More about this special crystal skull is discussed below including a photo that we were allowed to take. (c) Joshua Shapiro, gift from Al Ramirez "ANCIENT" or "VERY OLD" -- is a crystal skull which was fashioned at least 1500-2000 years ago or is much much older. It has been suggested that some of these crystal skulls could literally be (hundred of) thousands of years old based upon the studies conducted by various researchers. Also, it has been implied via the different legends or oral traditions of different indigenous peoples that the ancient skulls could come from a time of antiquity over a million years or more. Presently there are only a small number of such crystal skulls known publicly. As to the exact number of how many ancient skulls could exist, this answer is unknown as there is not an agreed to procedure or exact science that can show the age of a crystal skull when it was first created. Never-the-les there are a number of different ideas and theories that have come through paranormal means about how one can definitively identify if a crystal skull is "ancient" as people believe if a skull is in this category it has a greater value (which is not necessarily true). The two photos to the left are of the skull known as "AMI" which means friend. This name was given by a former guardian named Al Ramirez when in 2001 we conducted some scientific research upon this skull in San Jose, California. Again, many of these types of very old skulls appear to have some type of link with different Mesoamerican cultures as well as possible ties with various Native American tribes or nations within North America. We have even heard rumors of crystal skulls that have been found or are known within South America and in other parts of the world as well. In general however, we are unable to detect definitive tool marks upon the surface of an ancient crystal skull. The implications of this condition of these particular skulls suggests that either these skulls was done completely by hand (over a long period of time) or perhaps, there was some form of very sophisticated and advanced technology that was utilized to make the skull, of which we are not familiar with as of yet. Most of the so-called very old or ancient crystal skulls that we have personally met have a very intense energy field that surrounds them, of which many people are able to sense or feel. This energy field can be quite strong and powerful. The only way to really understand what a crystal skull is and how it functions is that we have to investigate the crystal skulls from both a scientific and paranormal perspective. There are a number of different theories that have been given as to explain how these ancient skulls may have been manufactured; some of which are quite fantastic in their scope. It has been difficult to trace the true history about where these objects as far as where they may have originated from or what parts of the world they have traveled through. Attempts have been made by various groups to work with trained spiritual sensitives while in the presence of a crystal skull and record the impressions that they psychically receive. However this method does not always guarantee success as the historical information channeled by these psychics does not always agree and even can be conflicting at times. (c) Joshua Shapiro & Katrina Head "APPORTED" -- is a crystal skull which was not created by a human being but came through or was linked to a spiritual medium that the object appears to just physically appear in our reality coming from nowhere. However, for those who are students of spiritual philosophies or religions that believe each of us is an immortal soul that never dies with a part of us that always exists on a spiritual plane, an apported skull would be a gift from these realms. "Spirit" then uses the power of mind to make the skull instan-taneously to appear in our reality. The photo to your left is one of the skulls we have that came through a spiritual medium from an energy vortex appearing in his mouth where other type of gemstones also came through the same evening. 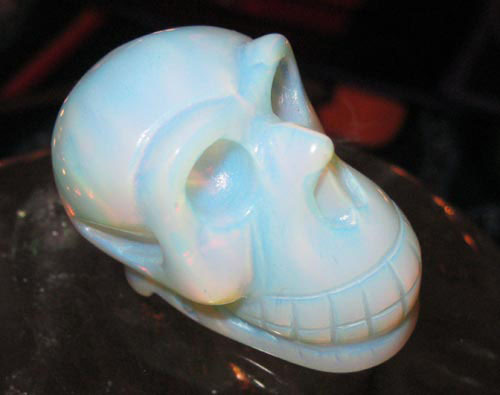 We call this skull "Khrisna" and it is made out of fire opalite. The public first became aware of the crystal skulls during the later part of the 19th century. At this time, many museums of the world became interested in displaying antiquities from past civilizations (Egypt, Greece, Mesoamerica, etc ...). Thus, in 1878, in the Musèe de l'homme (the Museum of Man) in Paris and in 1898, in the British Museum in London, each museum had a clear quartz skull on public display (note photo of the British Museum Crystal Skull before). It is stated by each museum that both of these crystal skulls were discovered within Mexico (possibly connected with ancient ruins or tombs) during the 1860's, at the time of the French occupation of this country. Eventually both of these skulls somehow came into the possession of a French antiquities dealer, by the name of Boban who sold the skulls which then finally found their way to the so-stated museums. During the research for our one of our books, "Journeys of the Crystal Skull Explorers" (only published in an e-book form in English along with various other editions in non-English languages in a printed form) we uncovered that there were a few other old or ancient crystal skulls that have made their way into private hands during the 19th century and only in a few cases, have these skulls been revealed to the general public. In a few cases, the guardians of these very old skulls began to travel with their skull and permitted other people to sit with them in private for a meditation or personal healing. As we entered into the first part of the 20th century, a new set of very special and unique crystal skulls mysteriously surfaced from all over the world. Not only was there also a strong connection with the ancestors of the indigenous people living in different parts of Mexico or Central America but with other parts of the world as well. Thus, as we now stand in the 21st century, more and more crystal skulls really are coming out from all over the world with new skulls surfacing in Europe and Asia and Australia. Indeed, to fully understand the mystery linked to the origins of the crystal skulls and their impact upon our world may take many lifetime. for use by the Crystal Skull Explorers "The Mitchell-Hedges Crystal Skull": named after famed explorer and adventurer, F. A. Mitchell-Hedges, discovered in Lubaantum, an ancient Mayan city in Belize in 1924. 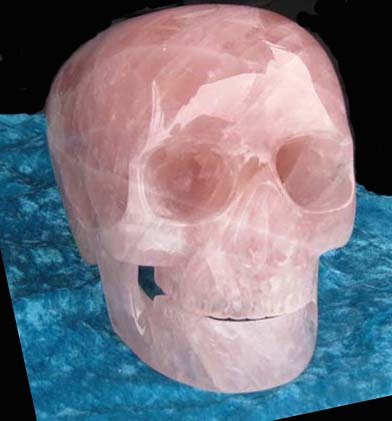 This skull is human-size and made from an absolutely clear piece of quartz that includes a removable jaw. It is an almost exact copy of our own modern bone skull. At the current time this skull is in the hands of his adopted daughter, Anna Mitchell-Hedges (since the time of her father's death in 1959). "ET": discovered by a Mayan family in Guatemala while digging on their property in 1906. 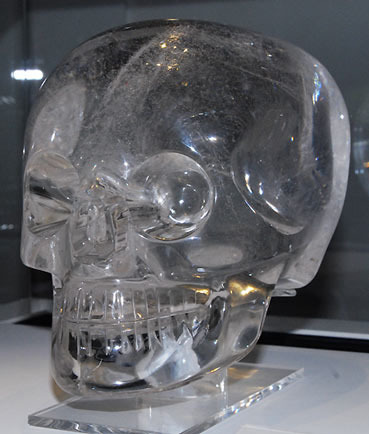 This crystal skull was obtained by Joky Van Dieten in 1991 through a crystal store near Los Angeles. It is the only known human-size ancient crystal skull that is made from smoky quartz. In appearance it has a resemblance to a type of "ET" shape with a slightly pointed chin and similarly pointed at the top part of the head. This crystal skull has at time traveled the world with Miss van Dieten who shared the skull with other people (including at times, some world leaders) to meditate with for world peace. Now this crystal skull with nine others from the van Dieten collection are with her son in Canada. This skull weighs about 12 lbs. "Max" -- an 18 lb (8.2 kg) clear quartz crystal skull purportedly discovered in a Mayan tomb in Guatemala between 1924-1926. The skull was gifted by a Mayan Shaman to a Tibetan-trained lama in 1970. It was housed within his healing center in Houston, Texas and used as a healing tool to assist numerous patients who came to the center. Upon the lama's death, the crystal skull was gifted to his close friends, Carl and JoAnn Parks. Currently Mrs. Parks is touring (primarily in the U.S.) with her crystal skull, providing many people an opportunity to experience this ancient skull directly. 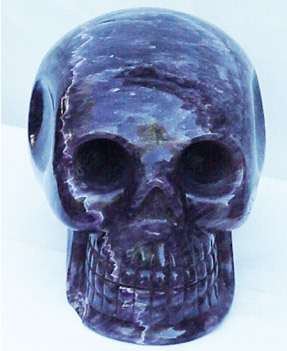 "Ami", the Amethyst Crystal Skull shown before: It is stated by its current owners that it was believed to have once been part of a collection of crystal skulls held by the Mexican President Diaz (from 1876-1910). Another report we have heard discussed that this skull may have been discovered in the Oaxaca area (Mexico) and was handed down from generation to generation through an order of Mayan Priests. This is smaller than human-sized skull and weights 8.5 lbs. (3.86 kg). The current location of "Ami" is unknown as this skull was sold to a private party in August of 2009 from the prior owners, who were a group of business men in the San Jose area of California. It should be further noted that as we move forward into each new year, more and more crystal skulls of the old or ancient type are constantly being revealed. Whether they are being found in the ground, one of the indigenous tribes brings it forward, a private guardian feels inspired to share their skull or sell it, and in other strange and unusual ways as well. One Mayan Daykeeper we know even has stated they are aware of thousands of skulls which exist. So, why are the Crystal Skulls so Important? "The Crystal Skulls function like our modern-day computers and were used in this capacity by various (advanced) civilizations in our past. They contain hidden knowledge and information that when it is time for this to be revealed, will ultimately assist humanity to create a Golden Age of peace and harmony upon our world!" "They were a powerful tool for healing [Body Mind and Spirit] within such cultures as the Mayans, the Aztecs or even the Atlanteans"
"Relative to today: We have witnessed many people's lives being profoundly affected after having had an opportunity to spend time in the presence of a very old crystal skull. 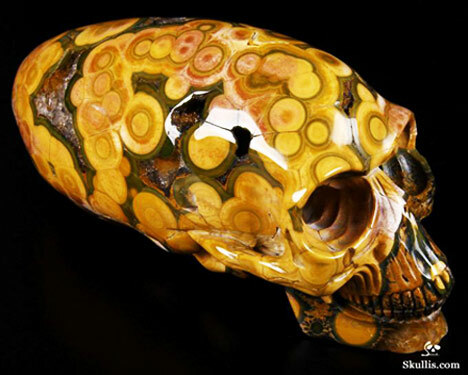 And even now, this type of phenomena is beginning to happen around the 'Contemporary Crystal Skulls' as well. Could the crystal skulls then be a type of mini energy vortex or better yet, a catalyst that is helping people to awaken to their true spiritual nature?" In truth, the best way to truly understand what the crystal skulls are about and to appreciate them is to have your own personal experience with one. So if you have a chance to meet a crystal skull along your path, may we encourage you to take advantage of this opportunity and see what will happen to you? Since everyone is not able to meet or afford to purchase one of the very old or ancient skulls, but feel they still want to be linked to the energy of the skulls, they have purchased one of the new or modern skulls via companies like Skullis. If you feel a strong affinity to the crystal skulls we recommend that you obtain one of your own. In the next section we discuss how to work with a crystal skull and bring it to life. How do the Crystal Skulls Touch People and How to Activate Your Skull? So how are the crystal skulls assisting people today in their every day life besides being just a great curiosity? 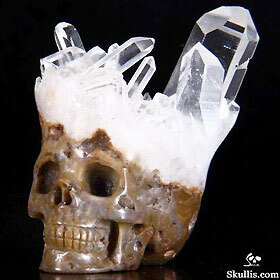 First, many people are using the crystal skulls for their personal spiritual growth or energy. 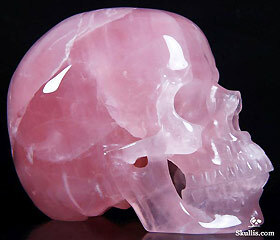 By meditating with an awakened or energized crystal skull - this can act as a catalyst to bring out your own spiritual gifts such as: your inner vision or open up your 3rd eye; enhanced dreams, sensitivity to different forms of energy; hearing spirit or having communication with your inner self; or perhaps helping to have clarity about one's life purpose or world mission. But a person should remember that as they seek to have these inner openings and know themselves better, there also can come some very intense transformations (like a "death and a rebirth"). So sometimes the crystal skulls also will act to bring out internal blockages (physical or emotional) which can put one into a temporary time of letting go which can be a little challenging till the old energy is released and cleansed. So You Say You Want to be a Guardian of a Crystal Skull, but once you have one - what do you do next? 1) You have to spend time with your crystal skull - this means to place the skull in your presence as much as is humanly possible when you first receive "him" or "her". This is so you can become adjusted energetically to the skull and its vibrational essence just as your crystal skull will do the same with you as "his" or "her" guardian. -- this implies that there is a living intelligence (or call it a "spirit:) that will work through the crystal skull. 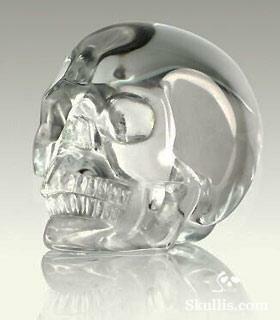 This spirit is drawn to this crystal skull due to your personal energy and vibration as a living energy being or soul! 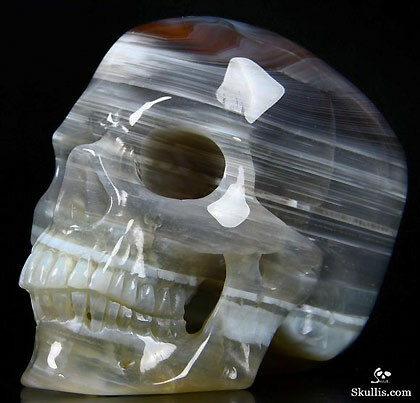 -- also when I speak about a crystal skull here in this article, my experiences is more with skulls that are made from quartz however we have heard of other people have special experiences with other gemstones as well made by modern carvers. Why is quartz so special though? -- quartz acts as a dimensional door which allows various spiritual or dimensional intelligences to work through them a bit easier I feel. OK, now let's get back to the main points of this article, the keys for activation. 2) meditation is another important key (see below for a definition of meditation), to take as much time as you have free and available, go to a place of quiet and peace and then meditate while either holding your crystal skull in your hands or having the skull close by in your physical presence. -- first, what is meditation? Meditation is a chance to shut down your logical mind and to listen to the inner part of your true self within, your soul. This is the real you that has all your answers about who you are and your purpose in life. Now to quiet the mind living in our modern society takes great discipline as our mind wanders and is constantly busy. This can be accomplished by focusing upon one thing whether it is a candle flame, a beautiful painting, a scene in nature or listening to music can help. -- assuming that you are able to go into a meditative state - this will help you to link more deeply into the essence / vibration / energy of your crystal skull which then will begin to develop a form of communication between you and the skull. For example, your crystal skull may send you telepathic messages or you may hear the crystal skull as a voice speaking to you (there are many ways the crystal skull can communicate with you, do not be limited in accepting how this might take place!). 3) ask the skull for its name. Each crystal skull will eventually give its guardian a name. How this happens is different for each person and depends upon which inner spiritual gift is your strongest (your intuition; do you feel things; a knowing of the right name that just comes into your mind one day; something you see like the same name 3 times in a row that seems to be a coincidence but is not; etc ...) This name in many cases might not be what you expect and there is no way to predict when and how the name will come to you. Do not be in a hurry to receive the name of the skull or try to put a pressure upon yourself to receive it; that is you must wait until your crystal skull ("she" or "he") is ready to tell you. Trust this process however long it will take. Sometimes the crystal skull will give to "his"/"her" guardian two names, one to be used privately and the other publicly. 4) many people ask us how (exactly) should they communicate with their personal crystal skull? The answer is quite simple, as the crystal skulls integrates with you, into your unique energy feel, the skull will know which inner spiritual gift is the strongest for you and thus will use such a gift as the easiest way for your personal skull to dialogue with you. -- An example: Are you intuitive? This means you hear either an inner voice or telepathic voice in your head (or mind) or for some people, this voice can be heard as an external spoken voice that you appear to hear through your ears. In my case, my crystal children talk with me using my mental or thinking voice and I can tell which one is speaking by the energy I feel linked to this inner voice. The message for me is given quickly however and sometimes I have to pause to receive it properly. -- Another example: You might feel something, either a type of energy or a specific feeling that is sent by the skull that offers some information or insights that you are able to translate from the energy/feeling into an idea. -- Yet again, another example: It is possible that you might see a vision or see the energy around the skull as colored lights. Perhaps this vision or the colors communicate a thought or feeling. Some people might also see a spiritual or dimensional being surrounding their crystal skull who will communicate with you in some form (telepathic or you will hear a voice with words). -- once you have developed whatever form of communication works best for you with your personal skull, then "he"/"she" will begin to tell you directly how to fully activate and awaken "him"/"her". In other words, you won't need to ask other people for advice any more. 5) be ready for your life to be completely changed as you continue to have contact with your personal crystal skull and work with "him"/"her". The crystal skulls have a tendency to bring out our best and worse. Their job is to help remind us about who we truly are as divine children of Creator. We strongly urge you not to fight or try to stop the new directions and changes your personal crystal skull opens up for you in your life as it acts as catalyst. Trust that your personal crystal skull is taking you to the right place. I hope these tips will help you to know a bit better how to work with your personal crystal skull(s) if you have one (or more) or, just be open to become a new crystal skull guardian if you don't have one, that a new crystal skull is coming your way soon. Before I finish this article, I think it is important to take a closer look at the talented carvers who are making all kinds of crystal skulls today. Really, if you go back in history, it was only since the mid-1990's that the newly carved skulls started to take off. We went from a time where it was difficult to find one store selling crystal skulls, let alone to find carvers on the internet till today, in 2015, when there are thousands of skulls for sale every day. As we mentioned early on in this article, our friends at Skullis have carvers who are able to duplicate almost every feature of a human bone skull in stone. Even though these carvers are using diamond tip tools to do this, still the carvers must be extremely talented and with sure hands to accomplish this. It has been theorized and speculated that the most accurate ancient crystal skulls required an advance technology to create them of which we still are unclear what this might have been, perhaps they used a form of advance lasers. Anyway, lets take a peek at an example of some the special modern skulls being done by Skullis to give to our readers a better clue of what type of skulls are now available. To understand what a crystal skull is from a physical perspective is easy, it is just a gemstone that a carver has shaped into a skull form, human or otherwise. However, when we begin to study and have contact with all the different type of crystal skulls that exist in the world, we discover there is a powerful energy that surrounds them which has a profound effect upon the people they touch. Plus, to many of the crystal skull guardians in the world, there is a living consciousness linked to their skulls which they are having a communication with and is giving them helpful advice as well as taking their lives into interesting new directions. Also, why do the indigenous people of the world regard the skulls as sacred tools? Is there something these people know about the skulls which we are just discovering? I am sure there is still much more we are going to learn about the crystal skulls in the future and that we will continue to see many new crystal skulls emerging into the public's eye. I also have had a vision (which could be a past life memory from Atlantis or an advanced civilization like this that once existed on our earth) that eventually we will have an electronic device with a monitor that can link directly into the information and knowledge that has been recorded and video stored inside the skulls in some way and presented back to us visually on the monitor. I believe such type of information will be revealed at some future time in this way which will greatly assist us and be a key to help us create a peaceful world. Anyway, if you do decide to get your own crystal skull, be ready for your life to change forever and you shall have some grand new adventures. Feel free to contact us if you have some other questions or Skullis has just about every type of crystal skull you can imagine. PS - My contact information is shown below. Again I wish to thank Skullis for this opportunity to share some of the interesting insights I have uncovered about the crystal skulls during my world travels and how they are changing people's lives in a positive way! Joshua Shapiro is known as a crystal skull explorer and works closely with his divine partner Katrina Head. 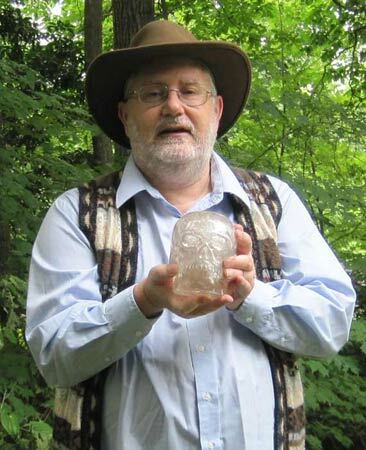 He has been involved with the crystal skulls for over 30 years, as an investigator, a public speaker and author. He has written several books on the subject including, "Mysteries of the Crystal Skulls Revealed" (with Bowen & Nocerino, published in 1989, there are a few copies left you can obtain through Joshua's main website); "Journeys of the Crystal Skull Explorers" (the free e-book edition 2010 with a new version coming out in June of 2015; the paid e-book from 2004 and a partial version of this book published in Poland, Holland and Hungary); plus the Travel Log series: Journeys of the Crystal Skull Explorers: Travel Log #1: Mexico 2009 (ebook only 2011); Travel Log #2: Search for the Blue Skull in Peru (ebook 2012, printed edition 2013) of which this series can be found on the Crystal Skull Explorers website.